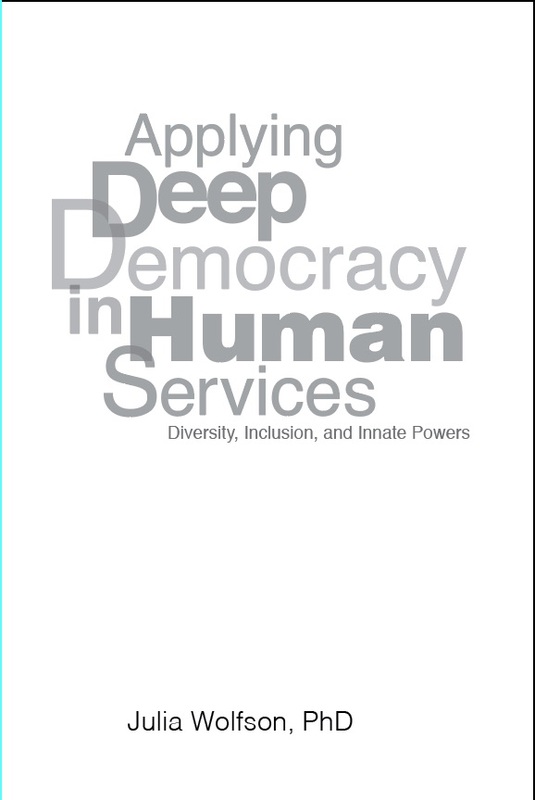 Eldership Academy Press is honored to offer “Applying Deep Democracy in Human Services.” the latest book by Julia Wolfson, PhD. Applying Deep Democracy in Human Services empowers those in need of care services, caregivers and care organizations using a strengths-based approach to recovery and change. Dr. Julia Wolfson is a frequent presenter at AgeSong Academy, an life-long education program for residents, volunteers and staff. She has presented workshops on changing the culture of care in ways that give equal emphasis to individual agency, reciprocity in relationships, and community belonging. Dr. Julia Wolfson, human ecologist, is founder of Turning Forward. She works with people, organisations and communities around the world. Buy a version for your Kindle! One billion people across the globe of all ages – one eighth of our human community – are dependent on health, disability and/or care and protective systems and providers. For millions of people, everyday survival depends on caregivers, supporters, care programs and funding. The need may be temporary, longer term or lifelong. Many people in care systems and assisted living settings are lonely, isolated and long to feel at home in a community with meaningful opportunities to participate and contribute. Mistreatment, exploitation and neglect in protective environments and institutions, has come to light in a sweep of shocking revelations and inquiries worldwide. Applying Deep Democracy in Human Services is relevant for caregivers, educators and direct support professionals, and people who rely on support and care. This book is also important for family members, policy makers and community developers, facilitators, leaders and administrators involved in this ever-growing and expanding field of human services. The nine innate powers explained, are a concrete way to address one of the core questions people in care institutions, educators and helping professions are grappling with: How best to respond to people who require assistance and care in a strengths-based, individualized and respectful way. Applying Deep Democracy in Human Services is a humanising and pragmatic response to addressing and preventing abuse and awakening inner resources for a self-directed life, rich with meaning, friendship and contribution. —Dr. Beth Barol, Associate Dean and Director of Social Work, Widener University, Pennsylvania, USA. — Agas Groth, CEO Camphill Communities, Botswana. Charlotte von Bülow, founder and CEO, Crossfields Institute, Awarding Organisation for specialist qualifications, Stroud, United Kingdom. —Dr. Sally Gelardin, AgeSong Community Engagement Director, San Francisco, USA. Paperback to be Available in June, 2017! This entry was posted in AgeSong Communities, Elders Academy Press and tagged abuse prevention, caregiver support, changing culture of care, different abilities, Dr Julia Wolfson, human services, person centered care, resilience, self-advocacy by AgeSongTeam. Bookmark the permalink.